I have a real fondness for post-WWI mysteries starring wealthy, middle-aged British detective types and the smart women they love and marry. Of course, I am equally fascinated by all the brisk, elegant allusions that Sayers employs to navigate around anything frankly sexual; it's like trying to read through a lace doily. I would also charge that this is most overtly a book about a marriage, rather than a mystery, and that the entire point of the mystery is to illuminate the marriage, or rather the breaking and mending of those who have married. Far from an easy settlement—though I can't imagine one would expect anything easy to come out of Gaudy Night—his long courtship of Harriet Vane has earned Lord Peter a victory that leaves him utterly at sea, and he finds marriage as taxing to the heart as the internal struggle of Gaudy Night was to Harriet's head. In other words, it is time to grow up and recognize the cost of things, and to take full measure of what it is to finally be another person's equal. 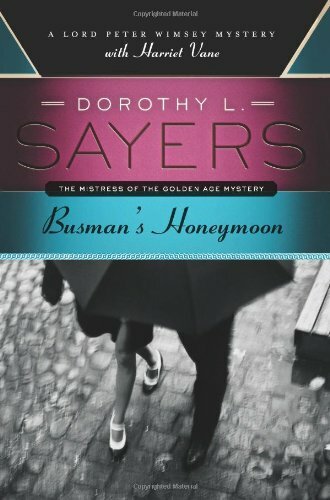 Busman's Honeymoon is also where Sayers leaves her characters (save a few unsatisfying and weirdly out-of-character short stories), and it's a fitting note on which to bid them a grateful farewell. Alas.